Summary from Goodreads: The past few years have held more surprises than part-angel Clara Gardner could ever have anticipated. Yet from the dizzying highs of first love, to the agonizing low of losing someone close to her, the one thing she can no longer deny is that she was never meant to live a normal life. I liked this book. A lot. I just can't say that I loved it. I'm struggling with how to review the book without spoilers, but let me just say that fans on both sides of the love triangle (which really seems more central than any of the plot twists) will find things in this book to love - and things to hate. Clara struggles to sort out her feelings for both Tucker and Christian. And it truly is a struggle. There were many times in the book where I honestly wasn't sure which choice she was going to make. Still, I felt myself being frustrated by the extremely small role that Tucker played in Boundless. Honestly, since it had been awhile since I had read the last book in the series, I found myself struggling to even remember what it was about Tucker that I loved so much. Since he only popped up in this book for short stints, I really had to rely on my memory for this, whereas the character of Christian was much better developed in the book. I would have liked a bit more balance since Clara herself was so unsure of her feelings. Summary from Goodreads: When the world ended, those who dwelled within the Dome were safe. Inside their glass world the Pures live on unscarred, while those outside—the Wretches—struggle to survive amidst the smoke and ash. Believing his mother was living among the Wretches, Partridge escaped from the Dome to find her. Determined to regain control over his son, Willux, the leader of the Pures, unleashes a violent new attack on the Wretches. It’s up to Pressia Belze, a young woman with her own mysterious past, to decode a set of cryptic clues from the past to set the Wretches free. An epic quest that sweeps readers into a world of beautiful brutality, Fuse continues the story of two people fighting to save their futures—and change the fate of the world. 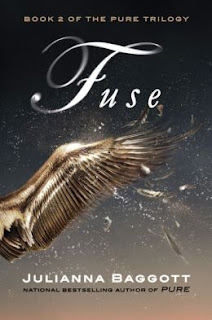 Fuse, like its predecessor Pure, is a gritty, post-apocolyptic YA novel that doesn't hold back. Baggott has created a detailed, intriguing world where no one is safe and where anything can happen. It makes for exciting reading because you're never sure what is going to be lurking around the next corner. This book picks up right where Pure left off, with Pressia and Bradwell struggling to uncover the mystery of their parents' lives and to find the elusive formula which may hold the key to a cure (both for those inside and outside of the Dome). Meanwhile, Partridge and Lyda face an uncertain future, struggling to determine their places in the world - whether it be inside or outside the Dome. Fuse is driven by character development and we are taken on a journey with each individual in the book - Bradwell, who needs to unlock the secrets of the past in order to justify his parents' death. Pressia, who is torn between doing all she can to help those in the present and recapturing a past she can't remember. Partridge, who struggles with the knowledge of what his father has done and wonders if he can be the leader that the Resistance is looking for. Lyda, who grows from a scared Pure who does what is expected of her to a young woman who makes her own choices. El Capitan, who finds himself vulnerable in ways he had never expected. Baggott doesn't leave any of her characters satisfied with the status quo.